All-Ireland quarter-finals are not supposed to be like this. The new Páirc Uí Chaoimh is a fantastic facility, and I fully accept that it needs more games. But that’s not a good enough reason to give it yesterday’s All-Ireland quarter-final, between two counties geographically further away than the pair that play this afternoon in Thurles. I assume politics were at play behind the scenes, but the decision to play this game in Cork, rather than Limerick v Kilkenny, was the wrong one. It clearly backfired because supporters from both counties voted with their feet and stayed away. An official attendance of just 10,250 lent it the atmosphere of a league fixture rather than what it actually was – one of the biggest games of the year for both counties. I lost count of the number of Clare supporters I met during the week, people who would normally travel but had decided not to. The extra distance to be travelled, the difficulties of getting in and out of the city on a busy shopping day, plus the knowledge there was a concert in the Marquee later that evening were all factors in a large cohort saying thanks but no thanks. That’s a pity, because despite the drawbacks, it’s a super place to both play and watch a match in. After a dreadful stop-start opening quarter, where scores were few and far between and there were as many wides as shots on targets, Clare finally got into their stride, with Tony Kelly to the fore. Paudie Foley was the one tasked with man-marking Kelly, but he struggled from the off. The Clare number 11 had four points from play by the 25th minute and by that stage Clare were six points clear and cruising. As expected, Shaun Murphy was dropping back as a sweeper for Wexford, but his distribution as the extra man was poor and they looked toothless in attack. By the break, only one of their six starting forwards (Conor McDonald) had scored from play. The Clare half-back line were completely on top, and they should really have been further ahead. A combination of some wayward shooting, poor decision making and the concession of some needless frees kept Wexford in it, albeit barely, behind by 0-16 to 0-9. With the way they’re set up to play, they’re not built to come from behind, and I felt that provided Clare didn’t concede goals, the game was theirs to lose. And that’s the way it remained until the last quarter when Wexford finally decided to push up and go for it. In control at 0-22 to 0-14, Clare switched off from a line-ball, and when McDonald picked up the break and finished brilliantly to the net, Wexford finally had some hope. Podge Collins got the next score for Clare, but Donal Tuohy had to pull off a superb save seconds later to maintain their six-point advantage. Three Rory O’Connor scores halved the deficit, but crucially, three successive wides in that spell – they had ten in all in the second half – when they had seized all the momentum was something Wexford could ill afford. 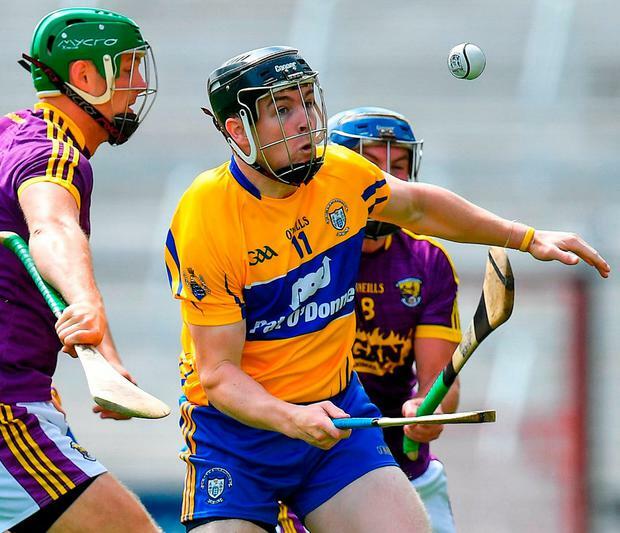 Shane O’Donnell, who was a threat all through, finally got Clare rolling again, and they finished strongly with four unanswered points; the final seven-point margin was probably an accurate reflection of the gap between the sides on the day. Five years on, Clare are finally back in Croke Park, and a date with Galway on July 28. They’ll have to find significant improvement, but they are in the last four and are there with a fighting chance. John Mullane And then there were four. The race for the 2018 All-Ireland senior hurling championship has been whittled down to champions Galway, Munster kingpins Cork, Clare and Limerick. Cyril Farrell At last – a weekend to draw breath. Never in the history of the hurling championships have the weeks between mid-May and mid-July been so busy, but now we’re left with just three more games.